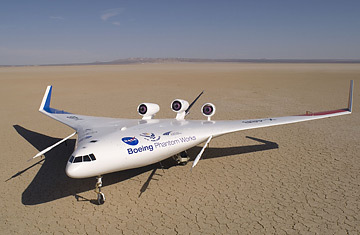 Boeing Phantom Works, with NASA and the Air Force Research Laboratory, has tested what it calls a "blended wing body," an 8.5%-scale prototype of what Boeing hopes will eventually be a fuel-efficient, quiet, high-capacity multipurpose jet for the military. The X-48B is destined for transport, bombing and intelligence. Wanna book a flight? Don't count on it ever going commercial.